Μάθετε κινέζικα μέσα μια λίστα προτεινόμενων εφαρμογών για iOs συσκευές. Οι εφαρμογές αυτές επικεντρώνονται κυρίως στην Κινέζική διάλεκτο Mandarin και διαφέρουν ανάλογα με τις ανάγκες εκπαίδευσης. What sets this app apart is its focus on the concepts behind the Chinese language and not just the language itself. The apps's introduction section does a good job of giving a basic historical overview, as well as explaining some of the different aspects of the language, which may confuse those who are unfamiliar with it. The main section of the app teaches characters, based on their etymology. You can also hear pronunciations, as well as see the proper brush strokes to write the characters. If you'd like to try before you buy, there's a free lite version; it's what convinced me to purchase the full version. Given the complexity of learning a new language like Chinese, it may not be a bad idea to approach it through the eyes of a child. Disney produces a Chinese learning app, featuring the beloved characters of Toy Story 3. Using pinyin, a system used to transcribe Chinese characters into Latin script, this e-book immerses you in a fun and safe learning environment. There are five different levels, ranging from all English to all Chinese. You can swipe a word to get its foreign language counterpart. As such, this app can be just as useful to a Chinese speaker learning English as it is to an English speaker learning Chinese. 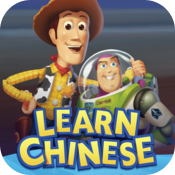 Of course, because of its focus on pinyin, Disney's app will not really help you in learning how to recognize, read, and write Chinese characters. That's what Chinese Writer, by Popup Chinese, is for. It allows you to learn the basics of writing Chinese characters with a 25 character tutorial. You can then register for a login ID on the Popup Chinese website, which will allow you to unlock an in-app practice mode with 1000 extra characters, in both simplified and traditional Chinese. Please note that there are separate iPhone and iPad apps, although both are free. This app, also called Chinese Writer, is a game. Characters fall from the top of the screen. You must tap on them and draw them correctly to earn points. Let five characters fall to the bottom and it's game over. Even after that, however, you can review the characters you tapped on and view their brush stroke diagrams. The app is an educational and amusing diversion, which should help keep your study of Chinese fresh. An essential tool of every Chinese student is a good English to Chinese dictionary. For someone new to the language, this free app is a good start. You open up the app and are immediately presented with a search menu, in which you can input English, Pinyin, or Chinese; results are also listed according to those categories. The interface for the app is simple and intuitive. For $3.99, you can also add a flashcard trainer and an external search function. The in-app purchase also allows you to disable ads. It is also possible for you to buy the dictionary with flashcard trainer as a separate app. As mentioned in the introduction, Chinese is a tonal language. This is the app for you if you want to train your ear. It is a test, which repeats the words ma ma in different tones. You need to identify which tone each ma is in. The test only takes a few minutes and will give you a good gauge of your ability to differentiate between different intonations. It is a valuable skill to have if you want to master Chinese. KTdict C-E may be the most accessible dictionary, but it's not the most powerful. Pleco is a popular dictionary app that can become so much more than just a dictionary. With paid add-ons, you can add additional dictionaries, an optical character recognizer, a flashcard system, Chinese text reader and more. I found the interface a little more complicated to use than that of the above app, partly because my ability to recognize Chinese characters is limited. But the app's potential as a comprehensive learning companion was clear. I would say that KTdict is the better Chinese-English dictionary for casual learners, while serious students will want to pick up Pleco. In terms of learning how to speak Chinese, apps filled with different conversational phrases are a good place to start. An example of such an app is Learn Chinese by Codegent. It breaks down its phrase lists into a number of categories, such as greetings, numbers and transportation. The phrases are recorded by a native speaker and you see both the Chinese characters and pinyin for each phrase. It costs $4.99 to unlock all of the categories. There are other similar apps, such as Learn Chinese by BravoLang. Most of these types of apps offer free versions, so I'd recommend shopping around and finding the one you're most comfortable with. SayHi is an excellent mobile interpreter. You can either speak into it with your voice or input text. You start with two languages and can freely translate between them. While not perfect, I found the translations to be fairly accurate. I even pasted in a three paragraph English letter and the app read it all back to me in Chinese. While apps with preset phrases are nice, it's helpful to see and hear the Chinese equivalent for any phrase you can think of. The translation may not be completely accurate, but it still serves as a valuable reference point. One of the best ways to learn a foreign language is through immersion. Although most of you cannot immerse yourself in Chinese culture firsthand, you can at least immerse yourself in Chinese media. Youku is like a Chinese YouTube; it is a large video hosting service. Youku has partnered with a number of film and television companies to upload a variety of media content. You may have a hard time navigating the site if you can't read Chinese, but once you've learned as much as you can on your own, watching Chinese video is a great way to take your knowledge to the next level. Perhaps you use the Rosetta Stone program to learn Chinese. Rosetta Stone is language learning software, which combines images, text and sound in gradually increasing levels of difficulty. TOTALe, available in separate iPhone and iPad apps, is the mobile companion for Rosetta Stone TOTALe subscribers. It provides the education of Rosetta Stone, even when you're on the go. The app is useless to those who don't use the Rosetta Stone program. However, given the popularity of Rosetta Stone, this app is worth mentioning. When you've finally reached a certain level of Chinese fluency, you may want to get certified. The Hanyu Shuiping Kaoshi, or HSK test, is the People's Republic of China's standardized test for non-native speakers, such as foreign students, overseas Chinese, and members of Chinese ethnic minorities. An HSK certificate can be used to prove your Chinese proficiency for colleges and jobs. This iPhone app will help you prepare for the big exam. It has thousands of sample questions, covering a wide range of difficulties. This is another app by Popup Chinese. As such, you can find even more resources on their site.